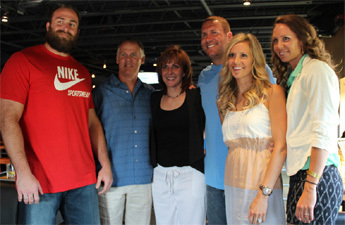 …in support of The Ben Roethlisberger Foundation! “It’s no secret how much the kids mean to me. When someone has a wish and they want to spend it with the Steelers that touches you and is special. For us to be able to do this and be able to have six kids’ wishes come true is awesome. Being there to meet them, shake their hand, sign an autograph means a lot to me.” — Ben, on his support for Make-A-Wish®. Ben will be hosting his Second Annual Ben Roethlisberger Foundation Fundraiser on June 2nd, at Jergel’s Rhythm Grille in Warrendale, PA.
How about a round of golf the following day? 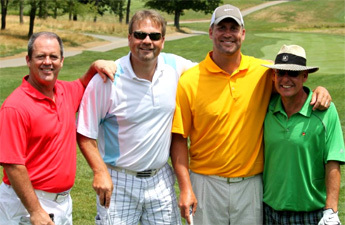 You can join Ben once again, but this time on the golf course at the Sewickley Heights Golf Club for the Second Annual Ben Roethlisberger Foundation Invitational! As with the event at Jergels on Sunday night, Monday’s tournament will benefit both Make-A-Wish Foundation and the Ben Roethlisberger Foundation. The golfers (and Ben) had a great time with the pre-tournament competitions, which included the Chip Shot Challenge, a Super Bowl XLIII Challenge (throwing the football through the hands of a cardboard Santonio Holmes), Shuffleboard Golf, a “Big Shot” Challenge (driving your way through the AFC North), a $5,000 Putt Challenge, and a $1 million dollar Shootout (165 yard shot). During the tournament, golfers had the opportunity to try their hand at other competitions along the course, including Poker & Roulette Golf, a Men’s and Women’s Long Drive, the Straight Drive, a “Coffin Corner” on the 9th hole, and a TPC Sawgrass “Island Green” hole on the 17th. Space is limited for the tournament, so make your golfing plans soon! You can sign up for the tournament, or learn more about it here.